Why Hire Silverfin Guide Service? You may think, "Why do I need a guide to take me to the Homer Spit Lagoon, or to the area rivers? I should be able to catch fish on my own." That may be true, but it might take quite a while to figure out how to do it. 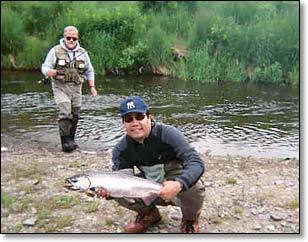 First, you need to know the Alaska sport fishing regulations and how to identify various species of salmon or trout. Next, you need the right equipment for the fishing situation, and the correct lure, fly or quality bait to maximize your catch. You need to know where you can fish legally and where the hot spots are. You’ll have to make the right presentation of your lure or bait to the fish, and finally, know how to successfully set the hook, fight and land that fish. You could save a lot of time, headaches and disappointment by allowing Silverfin Guide Service to teach you how to fish successfully in this area. Then you can go at it on your own.